Sorghum plants growing at the UC Kearney Agricultural Research and Extension Center. New research from the Department of Plant and Microbial Biology (PMB) demonstrates that exposing sorghum plants to drought conditions can shift the balance between specific types of microorganisms found within their root systems. The study, published today in PNAS, suggests that drought plays a role in restructuring the development of the early root microbiome, a finding that could help scientists develop crops that are more resistant to climate change. PMB faculty members Devin Coleman-Derr, Peggy Lemaux, and John Taylor conducted the research at the UC Kearney Agricultural Research and Extension Center on sorghum, a cereal crop known for its drought tolerance. The following PMB graduate students and researchers also contributed to the study: Zhaobin Dong, Cheng Gao, Mary Madera, Daniel Naylor, Grady Pierroz, Tuesday Simmons, Yi Wang, and Ling Xu. To understand the relationship between drought and sorghum’s microbiome, the research team studied a full 17-week growth cycle of the plant, taking samples weekly on the same day of the week and time. On each collection visit, samples were gathered from soil near the plants’ roots and rhizosphere—a microbe-rich soil region surrounding the root that is full of root secretions. A plant’s rhizosphere is home to a host of bacteria and other microorganisms, including fungi, which consume sugars and proteins sloughed off by root cells. Some of these compounds appear to provide a communication channel between the plant and bacteria, indicating the drought status of the plant. After studying these samples, researchers learned that under drought conditions, the development of a plant’s microbial community is delayed and the diversity of microorganisms in the rhizosphere decreases. But once a plant’s access to water is restored, its microbiome regains its diversity of bacteria. The discovery of this drought-induced microbiome enrichment of specific bacteria could offer a potential pathway for manipulating plant microbiomes in crops that are less drought-tolerant than sorghum. “This research represents an important step forward in our understanding of how and when plants recruit their microbial partners from the surrounding environment,” said Coleman-Derr. 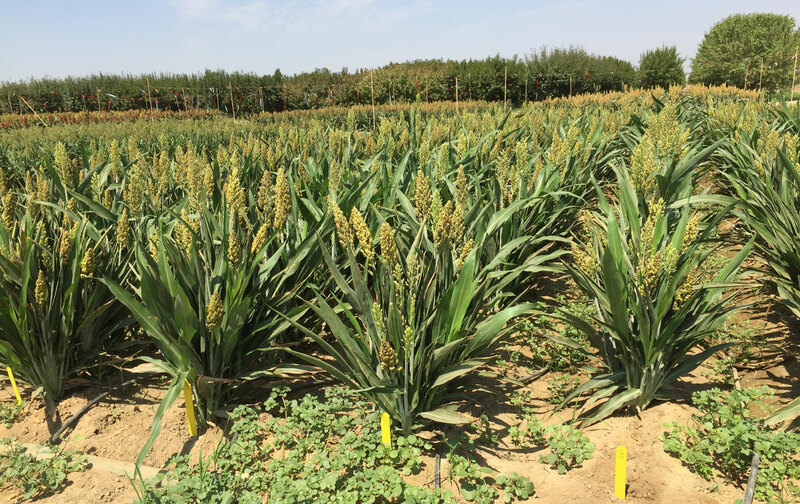 The paper is the first research published from a $12.3 million Department of Energy Biological and Environmental Research-funded project, which aims to develop an in-depth understanding of drought tolerance in field-grown sorghum. The project is a collaboration between PMB scientists Coleman-Derr, Lemaux, Taylor, and John Vogel, as well as Elizabeth Purdom from UC Berkeley’s Department of Statistics, Axel Visel and Ronan O’Malley from the Joint Genome Institute, ANR Research Station directors Jeff Dahlberg and Robert Hutmacher, and Christer Jansson, a researcher at the Pacific Northwest National Laboratory. For more information about this research, read Anna Katrina Hunter's article "Microbes in soil help sorghum stay strong against droughts" on Inside Science.